Let’s say you buy the cheapest light stand on the market after watching a couple of DIY videos and start to ply your trade with it. Right on the first job you’ll want to do something that your stand can’t get done. “If only I had this doohickey it would be perfect!” After a couple of jobs where the value of the doohickey in question is unquestionably justified in your mind, you buy it. Don’t fret. Everybody learns this way. Even if someone gave you a fully functioning light stand kit you wouldn’t be aware of all its possibilities until the need actually arose. The more you shoot and the more varied your production needs, the more important your light stand. After this article, you will know if you really need an expensive stand, or if a DIY or el-cheapo one will do. What is the purpose of a light stand? Looking at it this way, the light stand seems like a mythical creature, filled with magical powers. It is. 5/8″ (16mm) stud (like a metal eraser at the end of a pencil). The standard, also called ‘Baby’. Male thread screw. These are usually only found on light stands for photography or audio. 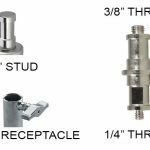 Comes in two standard sizes – 3/8″ and 1/4″ threads. 1 1/8″ (28mm) bushing (female thread, hole, receptacle). It’s also called ‘Junior’. The standard for heavier lights. It goes without saying that, for versatility, you have adapters of all kinds from one receptacle to another, in every permutation imaginable. The receiver is the part that your light fixture or accessory is connected to. Remember that saying about a chain being only as strong as your weakest link? It applies here big time. A receiver has to be long enough to hold the fixtures you want to use. In addition to this, the metal it is made of must not be cheap and too malleable. Otherwise, with regular usage, it will wear off more quickly. The most expensive industry-standard stands use stainless steel, sometimes chrome plated to avoid rust. The cheaper ones use lower-grade alloys. All use aluminum wherever necessary. The thinnest section will usually have a diameter of 25mm. That’s thick. Cheaper photography or audio stands aren’t that thick. Suffice to say, you either ‘plug’ something or ‘screw’ something on to a light stand. The more the options, the better. The first main task of the light stand is to bear the weight of the fixture. The stronger the material and thicker the stand, the more it can hold. The taller it needs to go, the thicker it must get to hold the same weight. The base ‘footprint’ is usually 100mm (39.37″- where the word ‘century’ comes from). For maximum balance, one always ‘puts one’s best foot forward’. On other words, point one leg of the stand in the direction the weight falls in. In case of C-stands, this will be the largest leg. This ensures the stand will not easily tip over in that direction. This is also the leg that holds the sand bags (more later). You most likely need wheels when holding HMI lights. Even otherwise, wheels are almost always healthier for the spine. One last feature about the turtle-base design is you have the option of having it spring-loaded. This means the legs snap shut easily, and fast. 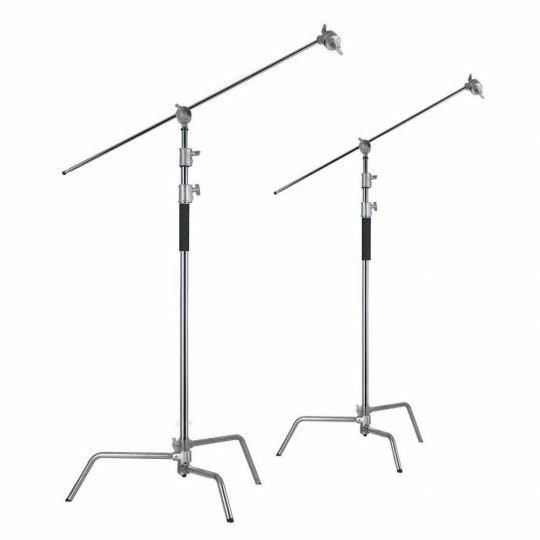 For these reasons (and more, as we shall see soon), the C-stand is the de facto standard for filmmaking light stands. It is simply a more versatile design. On the other hand, a tripod-base stand opens and closes, and that’s it. In between the tip and the base lies the column/section/riser. It can be one fixed height, but that’s rarely useful. Typically, the column is broken down into stages or sections. Just to clarify the terminology, risers and sections generally mean the same thing, except the number of risers is always one smaller than the number of sections. E.g., the most standard variety of stands have three sections and two risers (the above image has five sections with four risers). That’s because the lowest section cannot rise. Lights that need to go really low have their own stands, generally called ‘baby’ stands. These are smaller versions. A common question is: Which do you open up first – the lowest riser or the top-most one? Physics dictates you always raise the lowest section first, and close the top-most section first. Why? Notice each section has to ‘sit in’ the one underneath it. The lower ones are wider and hence more stronger. The top-most one is the thinnest (though not always the weakest). However, you cannot follow this rule when the light is already at its extended height. In this case, it is convenient to raise or lower the section that is closest or most convenient. The practice is therefore, to raise the top-most first and then the lower ones. The side benefit is that the top-most risers are also the lightest. Case closed. Most typically you’ll find spring or air cushioned stands, but they are an added cost. The typical 20″ C-stand weighs just above 5 kg (11 lbs) and has a payload of 10 kg (22 lbs). The 60″ C-stand can weigh as much as 8 kg (18 lbs) with a payload of 10 kg. How much is 10 kg? You could hold just about 2K worth of HMI. For heavier HMIs you have stands with greater payloads, some even with a capacity for 100 kg or more. Beware, these stands also weigh about 30 kg or more. 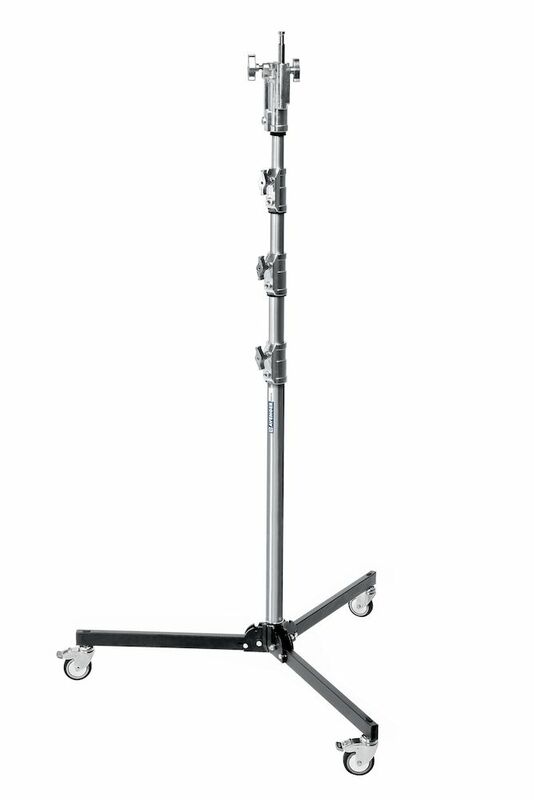 If you want to store or transport ten 20″ stands, you’re looking at a minimum combined weight of 50 kg without factoring in all the other grip and lighting gear, accessories, etc. Now imagine transporting larger and heavier C-stands. That’s why many balk at buying C-stands. You better be prepared to store and transport these things. Well, that covers the foundation of the light stand – the receiver, the risers and the base. In Part Two we’ll look at the rest. It’s the small details that really make the difference. The C-stand was manufactured to accommodate this size reflector and light.